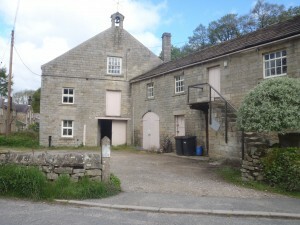 Wath Mill is a late 19th century mill built on the site of an earlier 16th century mill. It nestles between the Sportsman’s Arms Inn (right in banner image) and a terrace of early 19th century cottages, and is built partially into the hillside. A large mill pond is located above the mill (up the slope to the left in the banner image). The name Wath probably derives from the Scandinavian meaning ford, and it is likely that this refers to the crossing over the Nidd at the site of the present bridge. The mill pond is fed by Dauber Gill beck, which marks the historic boundary between the township of Bishopside, lands granted to the Archbishop of York before the Conquest, and those given to Fountains Abbey which eventually formed the township of Fountains Earth. The building is two storeys high and five bays long. It has a steeply pitched grey slated roof with a ridge top cupola and a bellcote with bell on the gable end facing the road. 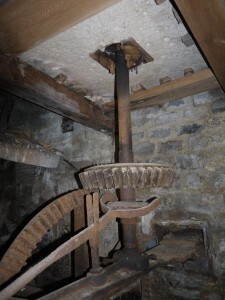 Much of the machinery within the Mill is intact. On one of the cast iron girders, to the south-facing elevation, is stamped ‘Mill rebuilt 1880’. The millwrights are also noted on this gable with a plaque inscribed ‘Crossleys of Cleckheaton’.